Stratasys has unveiled the world's first colour 3D printer that can use multiple different materials simultaneously, meaning U2 cover bands around the world can finally print Bono-style tinted glasses from the comfort of their own homes. The latest development in a growing field of devices, the Object500 Connex3 Colour Multi-material 3D Printer allows "virtually unlimited" combinations of rigid, flexible and transparent colour materials by combining droplets of three base materials, significantly expanding the usefulness of 3D printing technology. The printer also comes with six palettes for new rubber-like Tango colours, including opaque and transparent variations aimed at the automotive, consumer, sports, and fashion industries. These flexible materials will launch in the second quarter of this year. The new technology uses a similar approach to 2D inkjet printers to obtain the wide variety of possible colours, using the colour materials VeroCyan, VeroMagenta and VeroYellow. 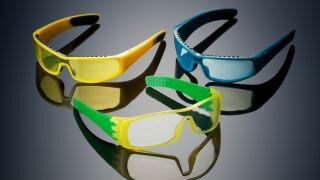 These add to an already large range of PolyJet photopolymer materials available for Stratasys' other 3D printers. Stratasys hailed the development as a time-saver for manufacturers, since it allows testing and validation of designs before a full manufacturing run. It can manage print jobs with up to 30kg of resin per cycle, allowing for high capacity production. The 3D printing market is expected to boom over the coming years. IDC predicts that 3D printer shipments will grow ten-fold by 2017. The Object500 Connex3 is available from Stratasys resellers immediately. What's all the fuss about 3D printing?